T3 is the first WiredScore pre-certified building in Minneapolis. WiredScore’s Wired Certification standard rates and recognizes buildings with best-in-class internet connectivity. Ample access is provided to the exterior street infrastructure ensuring that tenants can order service from a number of different high-speed internet providers. Fully diverse North and South Points of Entry will allow tenants to procure primary and back-up service offerings through completely separate entrances. Pathways from the Points of Entry to the Data Room will be in protected conduits to mitigate the risk of service interruption. Telecom Equipment will be kept in a well planned, dedicated Data Room, which will be connected to both Points of Entry for full redundancy. Two Risers will be constructed to support full fiber distribution to tenants while providing route diversity. Conduits throughout the building are sized appropriately to ensure that the building is future proofed to meet tenant connectivity needs. 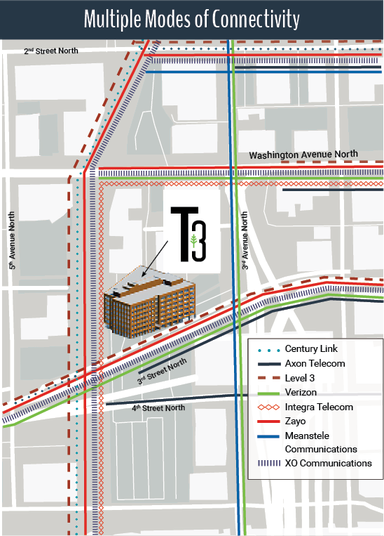 T3 incorporates a cell phone booster ensuring tenants better talk, text, and high-speed internet. The Wilson Pro 70 takes the existing cellular outside signal and amplifies it up to 32X with Wilson Electronics’ patented signal boost technology. Pro-grade signal boosters, serves over 300+ people simultaneously per panel receiver – there will be two receivers per floor.